The new Autoconer X6 represents a quantum leap in process automation. With its revolutionary Bobbin Cloud material flow system based on radio frequency identification (RFID) technology, the Autoconer X6 takes a definitive step towards Automation 4.0 in the winding field. This E³-certified machine is distinguished by even lower resource consumption and increased production. With its outstanding winding technology, the Autoconer is and remains the globally recognised benchmark for quality yarn and package production. Automation 4.0 with Bobbin Cloud, a revolution in material flow Characteristic features of the Bobbin Cloud include the decentralised processing aggregates and the material flow designed in a round loop. Like during a pit stop in Formula 1, the bobbins and tubes automatically move to the processing aggregates positioned along the guide ways. In order to increase cycle speed and capacity, several bobbin preparation stations, which operate in parallel, can be installed. The winding units are supplied reliably with prepared bobbins directly from the Bobbin Cloud. The entire circuit functions as a material storage area. 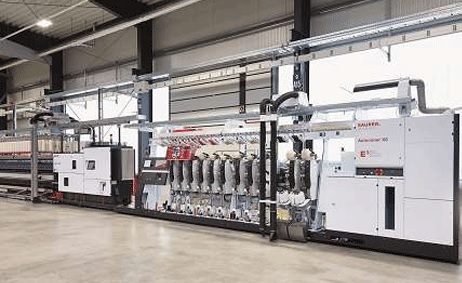 Energy: up to 20% lower resource consumption A comparison between the performances of the 5th and 6th Autoconer machine generations highlights the impact of process automation. The Autoconer X6 also offers attractive energy consumption reductions of up to 20%, which is mainly due to its high energy efficiency. All components and functions have been optimized in terms of this. These measures include improved aerodynamics in the airflow, state-of-the-art drives with high efficiency levels and the unique Power on Demand vacuum control.